…e alla fine arriva l’85…! 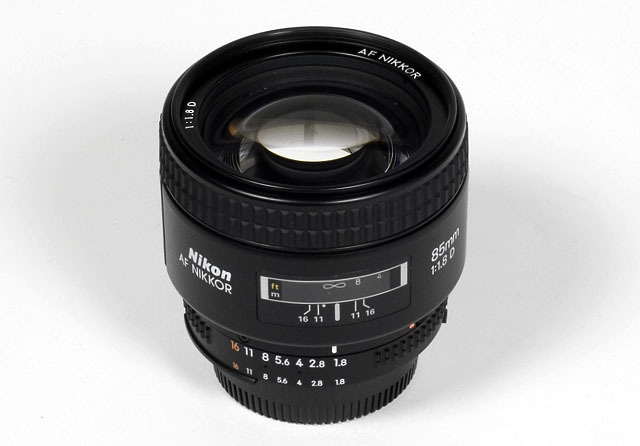 The Nikkor AF 85mm f/1.8 D is one of Nikon’s classic (full frame) portrait lenses. Unlike its faster cousin, the AF 85mm f/1.4 D it remains relatively affordable at around 480 EUR/US$. Nonetheless it is also comparatively expensive when looking e.g. at the corresponding Canon lens (EF 85mm f/1.8 USM) which sells at around 360 EUR/US$. As usual we’ll have a look how it performs on a modern APS-C DSLR (Nikon D200) where its field-of-view is equivalent to 127mm on classic full-frame cameras. As such it doesn’t leave its original scope. Typical for most medium to high-end Nikkors the build quality is very good. The outer barrel is made of good quality polycarbonate with a sleek finish. The rubberized focus ring operates very smooth and slightly damped. The AF 85mm f/1.8 D is a true IF (internal focusing) design so its length remains constant regardless of the focus setting and the front element does not rotate. Using a polarizer is therefore no problem. The lens has no internal AF motor and relies on a slotted drive screw operated by the camera. As a result the AF generates a moderate degree of noise. However, the AF speed is very fast thanks to a rear-focusing system. Other features Lens provides distance (D) information to the camera. The AF 85mm f/1.8 D shows extremely low distortions (0.03%) which are absolutely negligible in field conditions. The Nikkor AF 85mm f/1.8 D was a very boring lens during the tests simply because it showed a exceptional performance in all tested categories. Besides the lab results the lens shows a beautiful bokeh (out-of-focus blur). If I had to name a weakness it may be flare in contra light but it is a minor issue in the otherwise very harmonic package. So if you´re looking for a portrait lens or a similar application where you would like to isolate an object from its environment this is an ideal lens. Highly recommended! ~ di Massimiliano Tessaris su sabato 15 maggio, 2010.